With the turn of the calendar everyone’s attention will turn from Halloween to Thanksgiving in the United States. And that will ultimately lead to Black Friday and the annual sales that come with it. The deals from Nintendo include two a pair of items. The first is a Link green Nintendo 2DS system that comes pre-installed with The Legend of Zelda: Ocarina of Time 3D game pre-installed. The bundle will be available at a suggested retail price of only $79.99 USD. 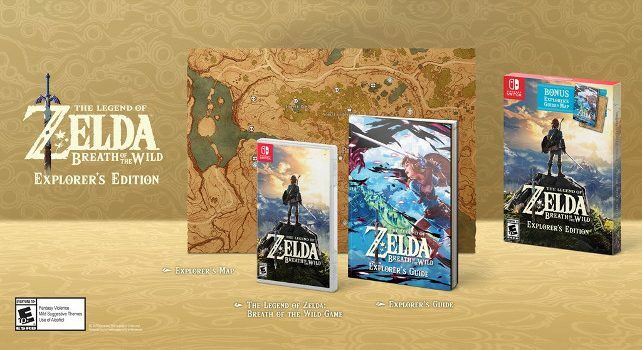 The second is The Legend of Zelda: Breath of the Wild – Explorer’s Edition, a bundle that includes the critically acclaimed and award-winning Nintendo Switch game, a 100-page explorer’s guide and a two-sided map at a suggested retail price of $59.99 USD. The Expansion Pass, which is composed of The Master Trials and The Champion’s Ballad DLC, is not included as part of The Legend of Zelda: Breath of the Wild – Explorer’s Edition. Nintendo will also have a few other bundles available, some of which are in stores now and some in stores soon. Nintendo Switch bundle which includes a download code for Super Mario Odyssey, Mario-themed red Joy-Con controllers, and a special carrying case for $379.99 USD. A white-and-red Nintendo 2DS system pre-loaded with New Super Mario Bros. 2 game at $79.99 USD (now available). A white-and-orange New Nintendo 2DS XL at $149.99 USD (now available). A Poké Ball Edition New Nintendo 2DS XL at $159.99 USD (launches November 3rd). A special edition of Xenoblade Chronicles 2 that includes a sound selection CD, a special metal game case and a 220-page hard-bound art book at $99.99 USD. A Nintendo Switch Pro Controller themed around Xenoblade Chronicles 2 will be available at $74.99 USD (both launch December 1st).